I'm back from a vacation in Istanbul where the wonders of an iPad and a Wi-Fi connection allowed me to download and read all of last week's 13 big new DC Comics series. I've got mini-reviews of all of the first wave below, but also some other other recommendations about the best new comics to get in stores or digitally this week. Buffy The Vampire Slayer Season 9 Freefall #1 I'm not a Buffy fan, but I love the idea that a cancelled TV show lives on in comic book seasons co-written by the series creator (Joss Whedon, in this case). Where are my Wire season six comics, David Simon? Daredevil #3 Still the best new series of the year, though Action Comics may knock it off that perch if Grant Morrison delivers more issues like the first. Gladstone's School For World Conquerors #5 Series writer Mark Smith tried to get my attention about this book several weeks ago. I finally downloaded the first four issues while I was on vacation and thought they were fantastic. As the title suggests, the comic is about a school for would-be super-villains. Except… maybe the whole super-villain thing is a sham. Maybe villains and heroes have an agreement, are merely playing roles and just haven't clued the kids in yet. The first two issues were excellent. The next two cooled, but I'm on board for at least a few more. Give it a read. Mark Twain's Autobiography 1910-2010 I don't always find Michael Kupperman funny, but the description for this book, well… "Michael Kupperman has already indulged his love for Mark Twain in the pages of Tales Designed to Thrizzle, but the recent publication of Twain's (real) autobiography inspired the cartoonist to a full-blown book-length masterpiece of hilarity. See how Twain hunted the Yeti, met the Six Million Dollar Man, had a love affair with Mamie Eisenhower, and accidentally became involved in X-rated films, all augmented with Kupperman's hilariously deadpan comics and illustrations." Optic Nerve #12 I always loved Dan Clowes' comics and often enjoyed Peter Bagge's. I'm amazed by Chris Ware and cherish Charles Burns' work. But of the 90's heavyweights of alternative comics, Adrian Tomine never clicked with me. Others love him, so do be aware that the new Optic Nerve is out today. Official summary: "In the new, long-awaited Optic Nerve #12, award-winning Shortcomings cartoonist Adrian Tomine returns to the multiple short story format familiar from early issues of the iconic series and showcases Tomine's trademark humor and observational skill. 'A Brief History of the Art Form Known as Hortisculpture' deftly manipulates traditional comics idioms to tell a story of horticulture, patents, and misunderstood art forms, while 'Amber Sweet' is a disconcertingly modern tale about a case of mistaken identity." Ultimate Comics: Spider-Man #1 Maybe you heard that the next Spider-Man in this alternate version of Marvel's hero universe isn't white. That's not the only reason to care. Brian Michael Bendis is writing this as part of what has, so far, been a strong relaunch of Marvel's Ultimate line where shocking events that couldn't be done in Marvel proper are supposedly set to occur. I know nothing about the new guy and am not even sure he has the same powers as Peter Parker. I'm on board for a bit. Ducktales #4 Official summary: "It's the epic conclusion to 'Rightful Owners.' Scrooge McDuck is on the brink of restoring his collection of returned rarities, but will a crisis of conscience be his ultimate undoing? You won't want to miss the action brought to you by Epic Mickey's Warren Spector and Marvel Super Hero Squad's Leonel Castellani, and of course the Disney Afternoon Revolution!"" Star Wars: The Old Republic: Lost Suns #4 Official summary: "Captured by the evil Sith Empire, Republic spy Theron Shan is about to find out what secret sacrifice brought about the end of the great war. But once the Imperial's covert activities are revealed, will he be able to act on his devastating discoveries? The senior writer of the online game The Old Republic continues to weave secrets for game players into this comics saga!" 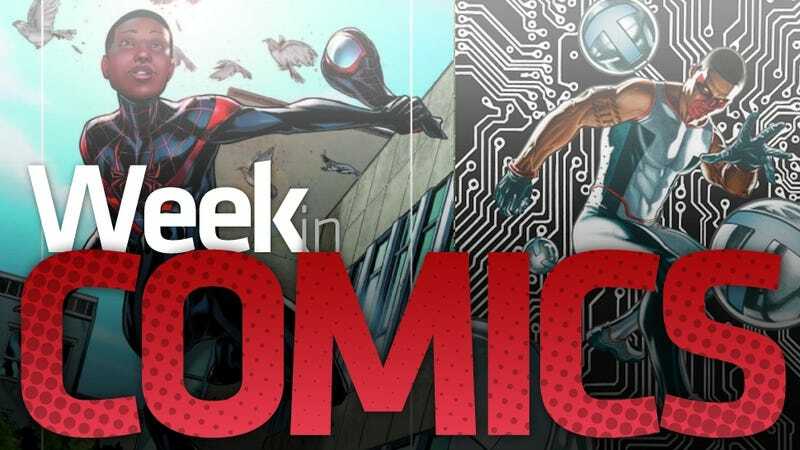 The ComiXology Comics app and website offer a fresh batch of new and old digital comics this week (and as of this week, Marvel's are available on Comixology's website, instead of just on iOS… but still not on Droid). Highlights this week include any of the new DC super-hero books you're interested in and Marvel's Ultimate books, since they all hit ComiXology on the same day they come out in shops. Other notables include a batch of issues from DC's pretty good One Million far-futuristic cross-over, and, well, not really that much else other than the standard latest issues in the digital reprinting of books like Promethea ad The Order. And about the new 52…. Action Comics. Excellent. Well-paced. Superman re-cast as a timely hero of the working class. Works well if you're a Tea Partier, a disgruntled liberal or anyone else who'd prefer their heroes to battle fraud authority figures rather than joe criminal. I'm sticking with this one. Animal Man. Art didn't match writing. Text piece had more charm than comic. Creepy. I trust the writer, Jeff Lemire, enough to stick with this one. Note that our Mike Fahey loved this, as did our sister site io9. Batgirl. Another comic about hospital hostage situation, which I just read in Animal Man. Uninteresting character and lots of odd scenes full of hammy emotional content that had to be explained: sappy breakfast with dad, roommate who likes to hug a lot. None of it felt natural to me. I'm dropping this. Batwing. Woefully in need of subtler writing that doesn't assume its readers are ignorant. Bribes, child soldiers… it is a survey of Africa problems written as a checklist more than a story. Jarringly strange art that doesn't flow. Was artist Ben Oliver not paid enough to draw backgrounds? Way to not pay off the distinct locale. Very strong premise, though. I'll stick with it. Detective Comics. Familiar Batman story beats: Who is he fighting, Who is he dating, How he gets along with Gordon, etc. I expected a bad comic. I got a solid one that took the safe route. Joker is an easy villain to us, though Batman's interior monologue illuminated nothing new or particularly likable about the character. His voice is bland. The action did move very well and brought us to an unexpected conclusion. A good balance of a satisfying single issue and a foreshadowing of a bigger plot. Green Arrow. Insane ratio of dialogue clichés per page. Vigilante Steve Jobs is a decent, if weird, concept. Making him an archer who fights people in France is asinine. I'll avoid any more of this. Hawk and Dove. Bad art, worse than expected writing. The basic concept of the characters is confusing. What exactly is Dove, avatar of peace, supposed to be able to do? Also: why not stop the terrorist plane you stowed away on before it takes off? I'm only sticking around to see who this brown costumed guy on the last page is. JLI. Laughable. Written for simpletons who don't mind illogical plots, a misunderstanding about how real institutions work and who are amused by stereotypical regional dialects. Why create a comic based on a beloved team just to write to none of that original book's strengths? This globe-spanning book has the cultural sophistication of Mike Tyson's Punch-Out. Won't read this again. Men of War. The tone was too severely ripped from war games and movies rather than anything that feels real. The book nevertheless launched a good concept of soldiers in superhero battlefields. The back-up story is for people who don't want subtlety in their entertainment. I'll try another few but am leery. Static. Lots of good setup of a teenage super-hero, his family and mentor but too much pseudo-science explanation of powers. Static is pleasingly green at the hero thing. But two books with black heroes this week that both end with the heroes physically maimed? Strange. I'll stick with it. Stormwatch. Dizzying amount of plot threads being woven. Interesting characters with interesting abilities. Weird art but a cool start for a series about super-powered people who are better at saving the world than super-heroes. Sticking with it. Swamp Thing. Amidst much of this mediocrity, here is a skilled writer at work. Rich art as well. A good set-up that feels like some sort of tale of Dr Jekyll and, forgive me, Mr. Flora. Sticking with it. Phew! That's it for this week. Tell me what you're reading this week and which great comics I'm missing.